The first definitive history of the Eyre Peninsula, Peninsula Pioneer, was published in 2006. It sold out very rapidly. Since its publication, many previously unpublished photos and considerable amounts of new research information have come to light. Peninsula Pioneer Revisited is more than just a second edition. It contains 44 more pages than the original, includes many additional photographs and images of early documents, and has been updated to reflect the latest research and to incorporate changes to current operations. More significantly, the new book uses colour throughout so that many photos which were b&w in the first book are now reproduced in full colour. And finally, the new book is presented with a hard cover. The narrow gauge Port Lincoln Division of the South Australian Railways has always been isolated from the rest of the SAR network, and it remains so to this day. Over its almost century developed a character all of its own. The book covers the Port Lincoln Division in detail, from inception to the present day. The first six chapters deal with the development of the network; these are followed by fourteen chapters covering different aspects of the railway, including train services, traffics, safeworking, fixed infrastructure and the people who made it happen. There are chapters describing every location on the Division (with track plans) and others detailing all locomotives, railcars and rolling stock known to have run on the Division. The final chapter deals with other railways and tramways on Eyre Peninsula, including jetty and other tramways and BHP's lines. The book is rounded out with a number of appendices, detailed referencing, an extensive bibliography and an index. 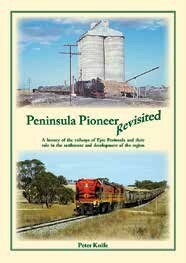 Peninsula Pioneer Revisited is published by the author, and was released in May 2013. It contains 382 pages, A4 size, hard cover. Over 500 photographs cover the whole period from 1907 to 2012, and 200 maps and diagrams are included.